Removal ProcedureRaise and support the vehicle. Refer toLifting and Jacking the Vehicle.Drain the transfer case fluid. Refer toTransfer Case Fluid Replacement.Remove the propeller shaft. Refer toPropeller Shaft Replacement.Remove the right wheel drive shaft. Refer toFront Wheel Drive Shaft Replacement.Remove the catalytic converter. For the LFW engine, refer toCatalytic Converter Replacement - Right Sideand for the LAF engine refer toCatalytic Converter Replacement. Remove the transfer case brace-(3). 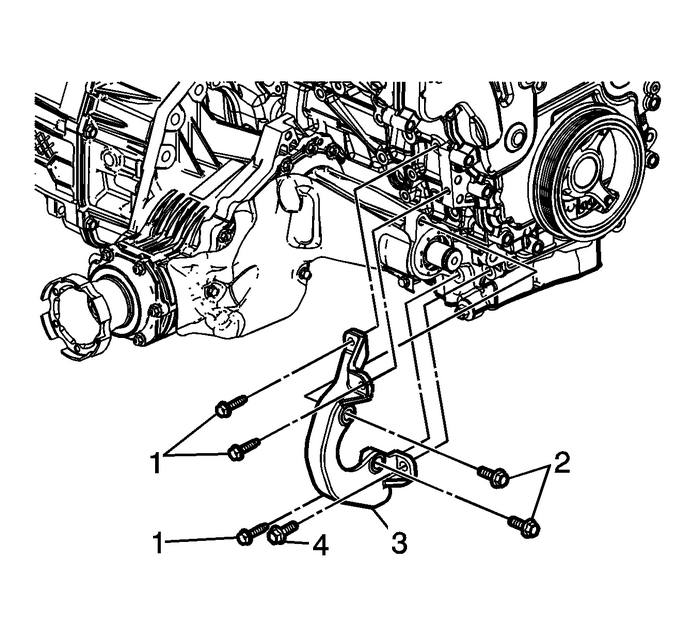 Refer toTransfer Case Brace Replacement.Remove the transfer case mounting bracket-(3).Support the transaxle with a jackstand.Remove the rear transmission mount and bracket. Refer toTransmission Rear Mount Bracket Replacement. Remove the bolts-(1) securing the transfer case to the transaxle.Remove the transfer case-(2) from the transaxle.Remove the transfer case to transmission O-ring for (LFW) engine or the gasket for(LAF) engine.Installation ProcedureInstall a NEW the transfer case to transmission O-ring for LFW engine or NEW gasketfor LAF engine. Lube the O-ring with light coating of automatic transmission fluid. 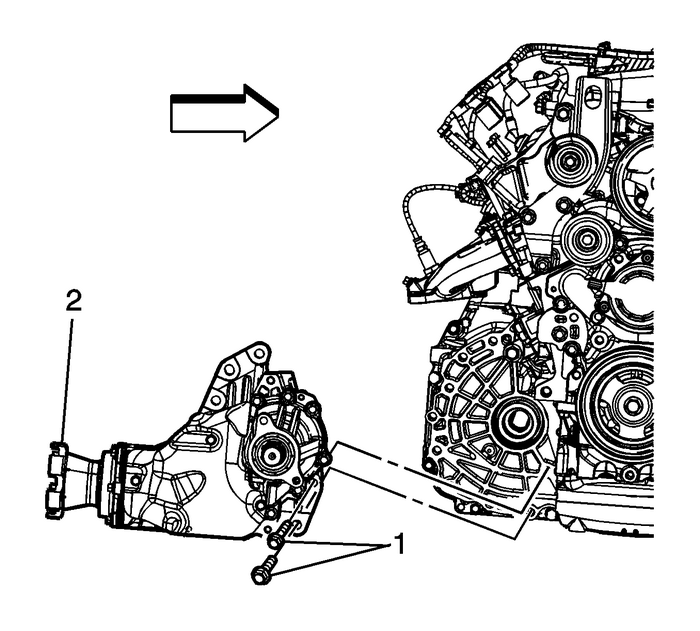 Install the transfer case-(2) to the transaxle. Install the bolts-(1) securing the transfer case to the transaxle and tighten thebolts to 50-Y (37-lb-ft).Install the rear transmission mount and bracket. Refer toTransmission Rear Mount Bracket Replacement.Remove the jackstand supporting the transaxle. Note:Tighten bolts in specified sequential order. Install the transfer case brace-(3). Refer toTransfer Case Brace Replacement.Install the catalytic converter. For the LFW engine, refer toCatalytic Converter Replacement - Right Sideand for the LAF engine refer toCatalytic Converter Replacement.Install the right wheel drive shaft. Refer toFront Wheel Drive Shaft Replacement.Install the propeller shaft. Refer toPropeller Shaft Replacement.Fill the transfer case with fluid. Refer toTransfer Case Fluid Replacement.Lower the vehicle.